Tourism is a thriving international industry with great employment opportunities within a variety of sectors, from travel and marketing to public and voluntary. As travel and business opportunities increase in the Spanish speaking world the ability to speak Spanish is a skill increasingly in demand by organisations. Why study BA International Tourism Management (Spanish) at Middlesex University? Our cutting-edge degree combines theoretical and practical study with a focus on global trends and current development in international tourism. The theory element offers a distinctive social science perspective covering topics such as sustainability, cultural tourism, and tourism in developing countries. The practical component offers a range of exciting placement and field trip options, enabling you to build professional industry experience, in the UK and abroad, while you study. Along with knowledge and skills highly relevant within the tourism industry you will also learn Spanish as part of your degree through specialist classes with an expert language tutor. Spanish is the fourth widest spoken language in the world and these additional language skills will help you to get ahead in an international tourism career, with great support offered by our academics and a study abroad year in a Spanish speaking country. *Middlesex acknowledges the formal support of the European Commission for the Erasmus programme. What will you study on the BA International Tourism Management (Spanish)? You will take Spanish language classes throughout your degree. In the final year you will advance your studies to include Spanish for global business. The module aims to enable students with little or no previous knowledge of the subject to acquire basic Spanish language skills (speaking, listening, reading and writing) but with a strong emphasis on the latter two and to promote an understanding of the Spanish/Latin American daily context in which they are located. The module aims to enable students with little or no previous knowledge of the subject to acquire basic Spanish language skills (writing system, pronunciation,grammar, vocabulary and usage of Spanish) but more specifically aimed at developing speaking and listening within a business context. With its business tourism orientation, the module also aims to introduce students to Spanish business tourism culture and increase their awareness of the professional environment in Spanish-speaking countries. The module introduces the disciplines, theories, issues and techniques in the social sciences that are relevant to the understanding of tourism in a broad social context. This includes the areas of sociology, psychology, political economy, economics, anthropology, politics and environmental studies. You will learn how these disciplines inform debates within tourism with particular emphasis upon the examination of the impact of tourism. A key aim is to demonstrate that an understanding of the social side of tourism is not a supplement to the business approach, but is essential to the successful operation of this sector. This module aims to build upon students’ abilities in Spanish language at intermediate level with a focus on the tourism industry in Latin America. In addition to expanding on the four skills of language learning (listening, reading, writing and speaking), this module will provide students with an understanding of Latin American culture and society with reference to history, geography, economy and linguistic variety. This module will expand on the skills gained in earlier modules in terms of linguistic skills and content-specific knowledge. This module aims to provide students with an understanding of key economic concepts, theories and skills necessary to evaluate the economic impact of tourism. It enables student to employ a data-driven approach to the evaluation of resources and opportunities in tourism as tourism professionals. The fieldwork will introduce basic research skills and also allow students to link theory to practice. This module aims to build upon students’ abilities in Spanish language at intermediate level with a focus on the tourism industry in Spain. In addition to expanding on the four skills of language learning (listening, reading, writing and speaking), this module will provide students with an understanding of Spanish culture and society with reference to history, geography, economy and linguistic variety. This module aims to generate critically informed understanding of the relationships between the tourist industry and key public passenger transport modes (including aviation, rail, coach and bus systems). The current standing of these modes -in terms of public –private relations, industry funding and management arrangements, and demand trends, will be situated within their recent historical context. The module will also directly address sustainability issues, and afford a strong focus to practical considerations relevant to securing employment in these sectors. 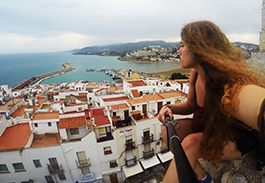 This module aims to let students to fully experience the culture, life and everyday life of Spanish-speaking societies by spending a full year at a hot university in a Spanish-speaking country. This module also allows students to set goals for important aspects of the Immersion Year, to log and evaluate their experiences, to review their goals and to record and assess details of personal and academic development in a Spanish-speaking environment. This module aims to build upon and extend students' abilities in Spanish at advanced level in business contexts, with stress on the tourism industry and to examine the input of key global economies on global business and the global tourism industry. This impact is also examined with reference to Hispanic countries, and to promote an understanding of Hispanic culture in general and in the business world. Students will analyse the main types of business communications in order to appreciate relevant specialised vocabularies and underlying cultural assumptions. To build upon and extend students' abilities in Spanish at advanced level in business contexts, with stress on the tourism industry. To examine the significance of the evolution of key global economies (the US, the EU and China) and the impact of their dynamic on global business and the global tourism industry. This impact is also examined with reference to Hispanic countries, with an emphasis on Latin America. To promote an understanding of Hispanic culture in general and in the business world. Students will analyse the main types of business communications in order to appreciate relevant specialised vocabularies and underlying cultural assumptions. To build upon and extend students' abilities in Spanish at advanced level in business contexts, with stress on the tourism industry. To examine the significance of the evolution of key global economies (the US, the EU and China) and the impact of their dynamics on global business and the global tourism industry. This impact is also examined with reference to Hispanic countries, with an emphasis on Latin America. To promote an understanding of Hispanic culture in general and in the business world. Students will analyse the main types of business communications in order to appreciate relevant specialised vocabularies and underlying cultural assumptions. This module examine some of the contemporary issues facing tourism through a global to local framework. The module aims to provide a critical awareness and understanding of alternative policy and planning approaches and the institutions involved in formulating policy responses. Case studies are used to explore the potential and limitations of different theoretical approaches. The primary aim of this module is to develop students’ understanding of the project management process along with a range of consultancy, research and problem solving skills. It will also give students the opportunity of presenting their research both verbally and in a written report to the client and offer them recommendations, which they may wish to implement in the future. The skills and techniques students gained as a result of this module will enhance their employability. This module aims to provide a critical examination and evaluation of the unique dynamics of heritage and tourism development from both social sciences and management perspectives. It thus attempts to integrate a rich diversity of academic discussions and industry practices in heritage and tourism studies. Students are expected to consolidate key theoretical frameworks surrounding heritage in tourism context and engage with contemporary practices of heritage tourism development at both global and local levels. motivations and roles of the private, public and third sectors in the development and execution of events will also be discussed and analysed. This module aims to examine and analyse the theories and practices of tourism management. You will explore the functions of management within the context of the tourism industry and examine management issues involved in different sectors of the tourism business. You will also be assisted in developing your professional skills and entrepreneurial skills in this dynamic industry such as creativity, communication, problem-solving, teamwork, project management, research and logical reasoning skills through planning and developing a day-tour itinerary. This module aim to build upon and extend your abilities in Spanish at an intermediate level with emphasis on the tourism industry in Hispanic countries. The module aims to promote an understanding of culture and society in Hispanic countries with reference to history, geography, political evolution, and culture. This will be used to contextualise the specific national frameworks within which the tourism industry operates in these societies. You will look specifically at some case studies both from Spain and Latin America. You will develop an understanding of the relevant vocabulary which is culturally-specific to these societies. This will include communication strategies appropriate to the tourism industry. This module has two aims. Firstly, it will provide you with the knowledge and understanding of key mainstream marketing and tourism specific consumer behaviour theories and models. Secondly, you will develop your skills in researching and analysing tourist behaviour. Tourist behaviour and decision making before and during tourist trips will be explored including but not confined to visitor attractions, events, weekend breaks, mass tourism, and specialist holidays. You will also be encouraged to look at different types of tourists. This module will allow you to fully experience the culture and everyday life of Spanish-speaking societies by spending a full year at a host university in a Spanish-speaking country. You will build upon and extend your abilities in Spanish in academic business and cultural contexts by taking a Term of Study Abroad at a Higher Education (HE) partner institution. You may also seek to undertake a company placement in the host country as part of your Immersion Year, but this will be subject to approval at Middlesex University. At the HE partner institution, you will be required to take two taught modules, one of which at least must be a business or business-related subject in Spanish at the host institution. This will furnish you with an intellectual understanding of subject-related disciplines in the host country and/or actual experience at a placement. You will consolidate and expand your specialised vocabulary in Spanish as well as your knowledge of specialised bibliography in subject-related issues. You will set goals for important aspects of the Immersion Year, to log and evaluate your experiences, to review your goals, and to record and assess details of personal and academic development in a Spanish-speaking environment. Combined, this will provide you with great insight into the learning of the discipline in Spanish. You will be able to immerse yourself in the host country and consolidate your learning of Spanish along with gaining concrete experience of the host country's cultural norms and protocols which will be invaluable assets in your professional life. This module will allow you to fully experience the culture and everyday life of Spanish-speaking societies by spending a full year at a host university in a Spanish-speaking country. You will further build upon and extend your abilities in Spanish in academic business and cultural contexts by taking a further Term of Study Abroad at a Higher Education (HE) partner institution. You may also seek to undertake a company placement in the host country as part of your Immersion Year, but this will be subject to approval at Middlesex University. At the HE institution, you will be required to take at least two taught modules, one of which must be a programme-related subject in Spanish. This will furnish you with an intellectual understanding of subject-related disciplines in the host country and/or actual experience at a placement. You will also consolidate and expand your specialised vocabulary in Spanish as well as your knowledge of specialised bibliography in subject-related issues. Combined, this will give you great insights into the learning of the discipline in Spanish. You will be able to immerse yourself in the host country and consolidate your learning of Spanish along with gaining a concrete experience of the host country's cultural norms and protocols which are invaluable assets in the professional world . You will be facilitated to apply generic principles of marketing management to the tourism industry, with a particular focus on distinguishing characteristics of hospitality and tourism products. The module aims to give you the opportunity to undertake an individual investigation in a chosen area of interest in the field of tourism. You will be encouraged to take responsibility for your own learning through conducting an in-depth study and demonstrate your abilities to select and appropriately use a wide range of sources to analyse, challenge and critically evaluate the views received. You will also be able to acquire and demonstrate the acquisition of a range of research skills being applied to the approved topic. This module builds upon your knowledge of the business of the Hospitality Industry from both theoretical and practical experiences. You will familiarise yourself with research and practice in the field of Strategic Management, Organisational behaviour, Human Resource Management, Work Psychology, Entrepreneurship, and Business Strategy in light of current affairs, technology, culture and globalisation to develop an ability to apply decision-making theories to hospitality operations whilst appreciating the difficulties and consequences of making changes within an organisation. This module will build upon and extend your abilities in Spanish at an advanced level in business contexts, with emphasis on the tourism industry in Hispanic countries. It will promote an understanding of Hispanic culture in general and in the business world. You will analyse the main types of business communications in order to appreciate relevant specialised vocabularies and underlying cultural assumptions. How is the BA International Tourism Management (Spanish) taught? You need no prior knowledge of Spanish or Mandarin for this course. 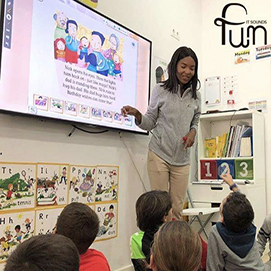 You will learn the language during the first two years through interactive classes and exercises, which will not only build your linguistic skills but also teach you about culture, society, history, politics and business in the target country. You will spend your third year abroad in a Spanish or Mandarin-speaking country, either on placement (probably as an English language assistant) or as an exchange student, before returning to continue your language studies in your final year. Please apply via UCAS using this course’s UCAS code NVR4. How can the BA International Tourism Management (Spanish) support your career? Learning Spanish at Middlesex University is not only about the language, it’s also about the culture, lifestyle, people, nature and history. Lecturers here teach with passion and desire to let you feel the real Spain. During one of our Spanish classes my lecturer Jose started talking about internships in Spain and Camino De Santiago, which is a network of hiking routes in Spain. 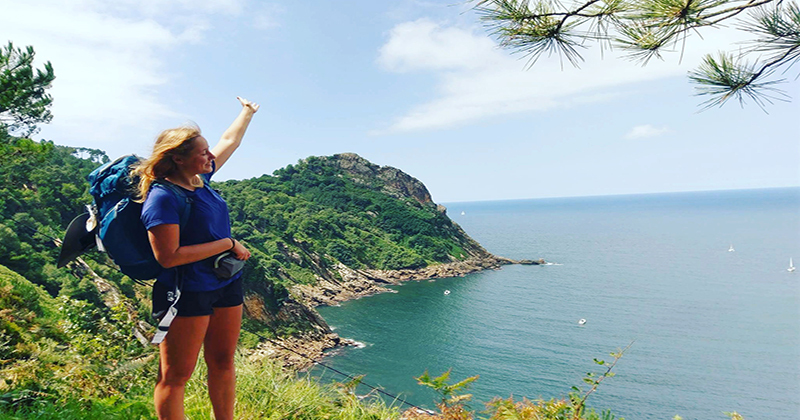 I was so inspired and amazed by the stories and pictures he showed that I decided to make the most of my summer and do both- an internship and Camino de Santiago! After my internship of two months in Lanzarote, I started to prepare for my new adventure. I have to be honest, being on foot for 31 days and having a heavy backpack was not easy. Despite all that, I had one of the biggest adventures of my life. I walked 900km along northern Spain! I saw magnificent nature, visited 4 different regions – Galicia, Asturias, Cantabria and Basque country. 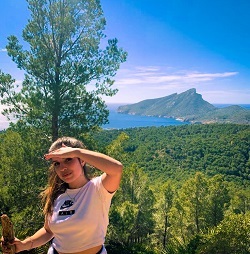 I saw the real lifestyle of Spanish people, tasted traditional dishes, saw stunning architecture of different cities, met lots of interesting people on my way, but most importantly, I gained so much self-confidence, strength, experience, ideas and discovered a different me. Erasmus was an amazing experience. As well as learning Spanish, I have learned and discovered many things about myself. I have become more independent and able to face occurring challenges. I discovered my deeper passion for travelling and started to build my website including art and travel photography. Erasmus in Spain was a key year of my international development where I met many people from multiple countries. In addition, I had a lot of free time where I could develop my artistic skills. Once I had the pleasure of creating an outdoor painting with an inspirational and professional artist. This is my best souvenir from Erasmus. The 10 months spent working and living in southern Spain as part of my sandwich year was an opportunity to fully immerse myself in a new environment. My new surroundings allowed me to put into practice what I had been learning over the past two years and further develop my language skills on a daily basis. During my placement, I was thrust into a foreign classroom environment and was given not only the responsibility but the challenge of teaching English to 124 students a week. This placement opened the door to a number of careers I had not previously considered before embarking on the course. My year abroad was testing at times, however the independence it provided me really allowed me to focus on personal development. Overall, this experience provided me with a higher level of confidence in my Spanish speaking and new teaching abilities and new found self-assurance. This past summer I decided to challenge myself and do an internship in Gran Canaria, Lanzarote as I'm currently undertaking International Tourism Management with Spanish. Motivated by my tutor and other students who had also done an internship, I decided to enrol in this experience to improve my Spanish speaking skills in a real life environment and to also enhance and learn more about hotel management. My internship in Spain will help me a lot in the future as I now feel much more confident when speaking Spanish and also because I had the opportunity to work in a hotel and learn more about the management of people and the hotel itself. We were given a lot of independent tasks at the hotel which have also made me feel more confident regarding my decision making. I definitely feel more prepared for future jobs.